Upcoming Fantasy & Sci-Fi Books: June 2016 | Nerd Much? Summer is fast approaching, and that means it’s time for beach reading (or reading in your backyard, or maybe just with the window open). While these may not be “beach reads” in the traditional sense, they are all definitely the kinds of books I would take with me on vacation. Forget romance and murder mysteries; I’ll be that person poolside with a hefty epic fantasy volume in my hand. Which is not to say that you won’t find elements of the aforementioned genres in this list; as usual, we’ve tried to include a variety of categories so that there’s something for everyone. This month will see the conclusion of a couple beloved series, as well as the beginning of several new and exciting ones. There are also several standalone novels for those who aren’t looking to commit to an entire series (I realize that’s a serious undertaking). 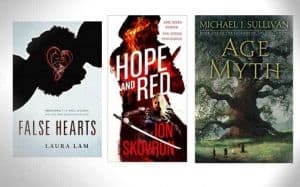 So, if you’re looking for summer reads of the nerdy variety, look no further; here is our list of the eight best upcoming fantasy and sci-fi novels for the month of June. 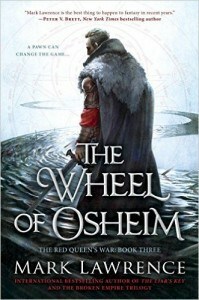 The Wheel of Osheim is the conclusion to the highly acclaimed The Red Queen’s War trilogy from internationally bestselling author Mark Lawrence. He first earned fame with his trilogy The Broken Empire, and this one may be even better (although both are some of the highest-rated epic fantasy out there). Similarly to George R.R. Martin, though, his writing is not for the faint of heart. This trilogy is set in the same world as The Broken Empire, but has a much darker and more epic feel (although it definitely still has its comedic moments). This third installment follows our reluctant hero, Jalan, as he returns from the bowels of Hell and must contend with armies of the dead and the Wheel of Osheim threatening to crack the world. Jalan has displayed remarkable character development thus far, and that only continues into this book as we see his inherent selfishness contend with the heroic role he is thrust into. He is very complex and relatable, so the reader can’t help but care what happens to him. Many are calling this Mark Lawrence’s best book to date, so you definitely don’t want to miss it; if you haven’t read this series yet, go back to the beginning (Prince of Fools) and bring yourself up to speed. 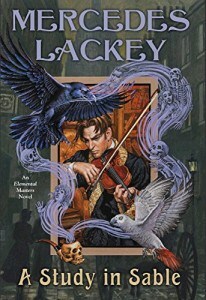 A Study in Sable is the twelfth book in Mercedes Lackey’s Elemental Masters series, wherein each book is loosely based on a fairy tale, and the Elemental Masters are people who have magical control over one of the elements. This particular novel features one Sherlock Holmes, and that’s what has us particularly excited for it. In it, Nan Killian and Sarah Lyon-White are sent to assist Dr. John Watson and his wife Mary, who are Elemental Masters of Water and Air, and tend to take on more occult cases than their famous associate. Together, they must confront the infamous Haunt of Number 10 Berkeley Square. Mercedes Lackey is a highly acclaimed fantasy author that has been around for quite some time, so she obviously knows what she’s doing. This series is holding up quite well considering it’s on its twelfth entry, and this is just a fun read. 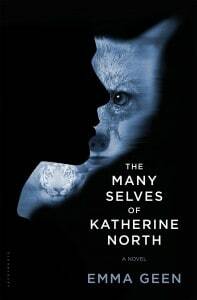 It could possibly function as a standalone novel if you haven’t read the previous eleven books, but of course we recommend that you do so if you have the time. The entire series is well worth it. Kit is a teenager working for the Shen Corporation as a phenomonaut; in other words, she can project her consciousness into lab animals. We first see Kit as a fox (which seems a little too obvious, but bear with me). She’s been doing this for seven years, which is longer than anyone else at the company. Her best friend Buckley is also what’s known as her Neuro; in other words, he is a computer engineer who guides her through her consciousness projections. Things take a darker turn, however, when ShenCorp begins to turn to more commercial pursuits, causing Kit to question everything she knows. Emma Geen truly does a fantastic job at putting the reader inside the minds of the chosen animals and helping to see the world from their perspective. The book explores some powerful questions related to reality and the nature of consciousness, as well as how our physical bodies influence our perception of the world. It’s highly recommended for animal lovers and sci-fi fans alike. 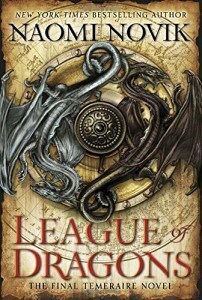 League of Dragons is the ninth and final installment in Naomi Novik’s bestselling Temeraire series. It’s been a fantastic ride, reminiscent of Anne McAffrey’s Pern novels; however, all good things must come to an end. Temeraire falls more into the realm of historical fiction, as it takes place during the Napoleanic Era – but with the added element of dragons. And let’s face it: dragons make anything and everything better. Following Napoleon’s defeat in Russia, the French army flees back to Paris with Lawrence and his dragon Temeraire in hot pursuit. They learn that the French have stolen Temeraire and Iskierka’s egg from China, and they will stop at nothing to not only defeat Napoleon, but rescue Temeraire’s offspring. It’s been three years since the last book was published, and this satisfying conclusion is well worth the wait; it’s sad to say good-bye to Lawrence and Temeraire, but exciting to see what else Ms. Novik may have in store for the future. Fans of the series should be sure to pick up the thrilling conclusion, and those who haven’t read the series yet should definitely check it out. This book is about a time-travelling library spy – need I say more? 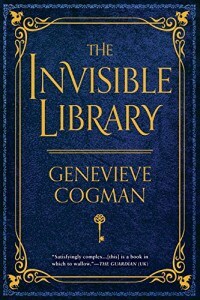 The Invisible Library is Genevieve Cogman’s debut novel, and the first in a new series that’s recommended for fans of Doctor Who. Irene, the main character, is a spy for the mysterious Library, and travels to alternate realities to retrieve works of fiction. When she travels to an alternate London with her assistant Kai, she finds that the book she is after has already been stolen, and she finds herself in a dangerous conflict with various secret societies. To top it off, her assistant is hiding secrets of his own; also, this world allows for magic and supernatural creatures. This is a fun, lighthearted YA read with an awesome female main character; in other words, pretty much checks all our boxes. The author is a self-professed Sherlock Holmes fan as well, and you can definitely see the influences here; which, as mentioned before, is another major selling point for me. This could be the next big thing in YA books, so if this sounds like your cup of tea, you should get a jump on it. 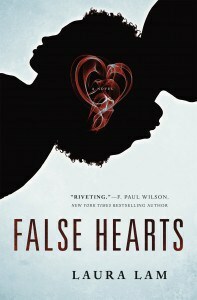 False Hearts by Laura Lam is described as “Orphan Black meets Inception“; okay, you have our attention. Conjoined sisters Taema and Tila move to San Francisco when their shared heart begins to fail, whereupon they are separated and given artificial hearts. Then, their life takes a turn for the unexpected when Tila is implicated in a homicide (the first in decades), and she is suspected of involvement with a crime syndicate known as Ratel, which deals in the movement of a powerful hallucinogenic drug called Zeal. Taema must go undercover as her sister in order to save her life, and in doing so, she uncovers secrets she never could have imagined. Laura Lam has already authored several little-known but highly-rated books, so perhaps this could be her breakout novel. It’s certainly deserving; the concept is fantastically original and well-executed, the plot is fast-paced and compelling, and the sisterly relationship at the forefront is fantastic. All in all, it’s a fantastic earthbound sci-fi thriller, with a setting that is believable yet appropriately futuristic (with cool concepts like drug-induced lucid dreaming and brain hacking). You definitely need to get your hands on this when it releases. 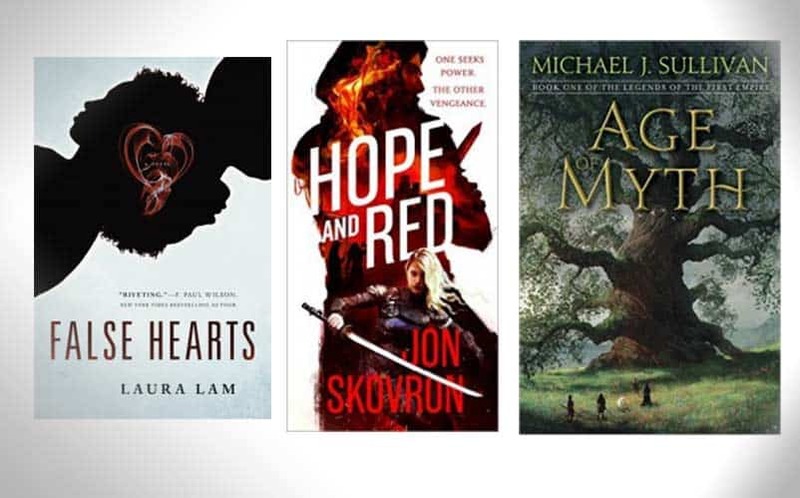 Michael J. Sullivan is one of our favorite contemporary fantasy authors (right up there with Brandon Sanderson and Jim Butcher), and his newest series looks to be every bit as amazing as The Riyria Chronicles and Revelations. Although this takes place in the same world (years earlier), it is something entirely different; in Age of Myth, humans worship godlike beings called the Fhrey, who are seemingly immortal. That is, until the day they are killed by a human blade, and the balance of power between the races is permanently altered. Humankind rebels, and a small band of heroes is all that stands between them and total annihilation. Sullivan’s books are immensely fun to read; they are not as heavy or gritty as some epic fantasy, which can be refreshing when you’ve been reading the likes of George R.R. Martin. They manage to be lighter while still retaining all the elements you love about epic fantasy; the worldbuilding is spectacular, the characters are dynamic and relatable, and the plot is wholly absorbing. The novels are fleshed out without getting bogged down with wordy descriptions, so it’s easy to keep turning the pages. 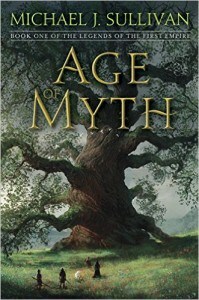 Age of Myth looks to be much the same, and we highly recommend it, even if you haven’t read the Riyria books; this would be an ideal starting point for those interested in Sullivan’s work. 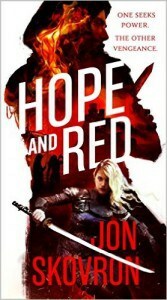 Hope and Red is the first book in the new Empire of Storms trilogy from little-known author Jon Skovron, in which two children seemingly abandoned by their respective cultures unite with a common purpose and accomplish more than they ever could have dreamed. One is a nameless girl whose village is destroyed by biomancers; she becomes known as Bleak Hope, and is trained by a master Vinchen warrior for vengeance. Elsewhere, an orphan boy is adopted by a powerful woman from the criminal underworld and dubbed Red; he is trained as a thief and con artist. Hope and Red form an alliance when biomancers, led by ganglord Deadface Drem, threaten the slums of New Laven. For most of the book, the two childrens’ stories are separate, and it alternates between their points of view; only in the last third of the book do they begin to coincide. They are both great characters, and the dynamic between them when they finally meet is equally fantastic. Their ragtag band of companions are entertaining, as well, and each adds a unique flavor to the story. The series is off to an impressive start so far, and we can’t wait to see what the author has in store for the subsequent books. For more book news, reviews, and lists, follow us on Twitter for the latest updates.